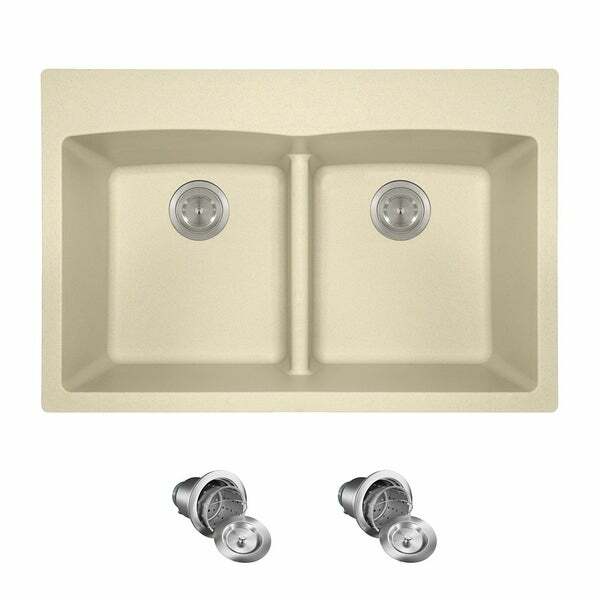 The T812 topmount sink is made from a granite composite material that is comprised of 80% Quartz and 20% Acrylic. The T812 is stain, scratch, and heat resistant up to 550 degrees. The overall dimensions of the sink are 33" x 22" x 10 3/4" and a 36" minimum cabinet size is required. The sink features a low divide and multiple punch-out faucet holes. This sink ensemble is available with your choice of two basket strainers, two color matched strainers, or one color matched strainer and ring cover for disposal. As always, our TruGranite sinks are covered under a limited lifetime warranty for as long as you own the sink. Dimensions 22.0 In. X 33.0 In. X 11.0 In.